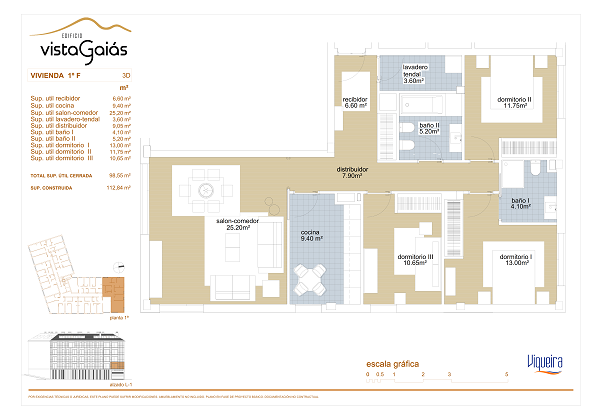 Residencial Vista Gaiás will be a residential building comprising 30 two, three and four-bedroom apartments. It is located in the popular neighbourhood of Conxo in Santiago de Compostela. Shaped like an “L”, the building consists of a basement, ground floor and four floors of apartments; many of the properties on the top floor are duplex apartments. The main façade of the building overlooks two streets: C/ Manuel Beiras and Rúa da Ponte Pequena. The rear of the building opens onto a park and a recreation area equipped with a multipurpose court. 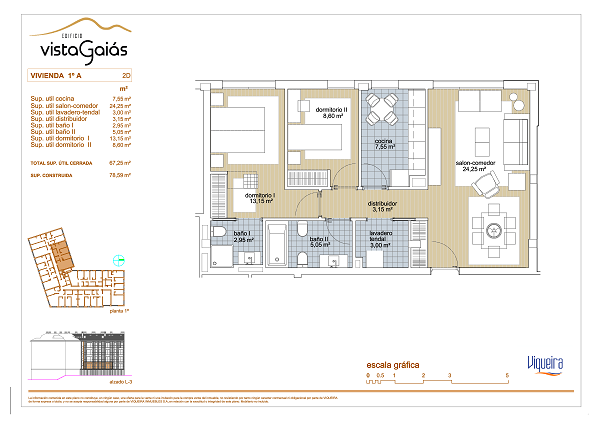 The Vista Gaiás project is Viqueira’s first housing development in the Galician capital. Therefore, we undertook a detailed study to identify the needs of potential home buyers and, based on the results, special attention was paid to the interior layouts, choice of materials and to creating a modern and original design. The Vista Gaiás residential development is just 10 minutes’ from the centre of Santiago and has all kinds of services and amenities in the immediate vicinity, such as supermarkets, child care facilities, gyms, chemists, etc. In addition, the neighbourhood of Conxo is characterised by open spaces, making it ideal for a quiet and relaxed lifestyle. Don’t hesitate to contact us for more information about Residencial Vista Gaiás by completing and emailing our contact form or phoning us on 986 294 400. We’ll be delighted to answer any questions you have!